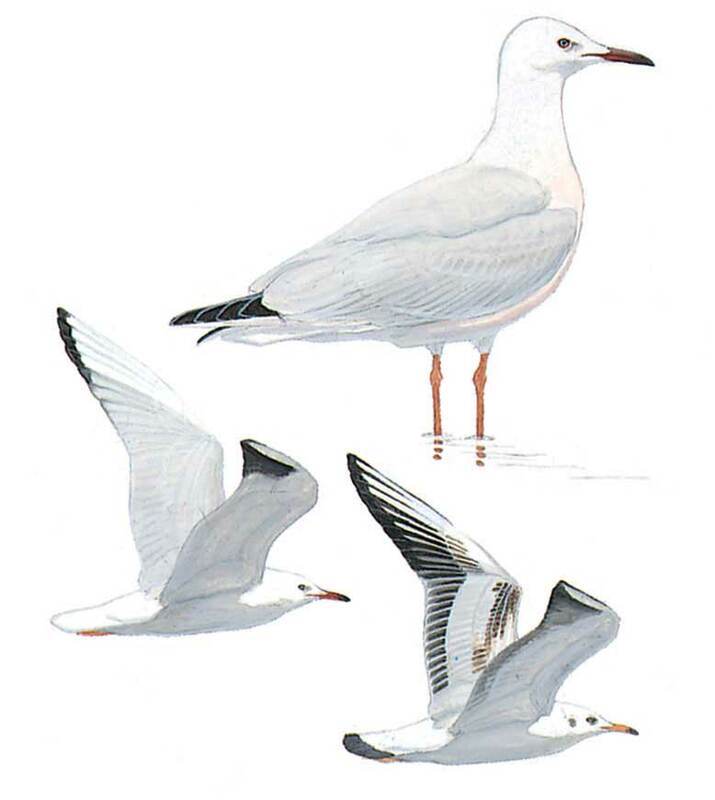 Medium-sized gull with wing pattern almost identical to Black-headed, but head completely white in summer when breast often has rosy tinge. Larger than Black-headed with different build; bill distinctly longer, forehead rather sloping with longer upper mandible feathering accentuating length of bill, giving ‘snoutish’ effect. Legs longer (stands higher); when relaxed breast more bulky but when alert appears curiously long-necked. In winter, often shows small greyish spot on ear-coverts, (larger, blacker in Black-headed), but no vague bar over crown or nape (as in many Black-headed); iris pale in winter but dark in many breeding birds (always dark in black-headed); no obvious white eye-crescents. Dark red bill often appears blackish at distance, contrasting with white head. Apart from structural differences, juvenile and 1st winter also told from Black-headed by pale bill with poorly marked, or unmarked tip (tip always dark in Black-headed); differences in head pattern as in winter adult; starts to show pale iris during 1st winter (sometimes before). Inner upperwing paler, more bleached in appearance than Black-headed’s. Appears longer-winged and -tailed in flight and the long neck protrudes more than in Black-headed.